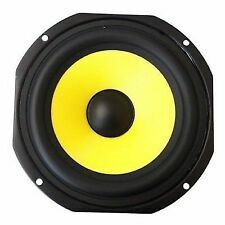 Replacement 12" 300W Bass Speaker Driver Cone 902.542. What if I have not received my order?. In Ear Monitoring. Can I reserve item(s) that I intend to buy later?. What is the warranty period on Electromarket products?. When will I receive confirmation of my order?. In Ear Monitoring. What if I have not received my order?. What is the warranty period on Electromarket products?. When will I receive confirmation of my order?. Effects Fluid. Pairs of Speakers. How do I find the item number or product code?. 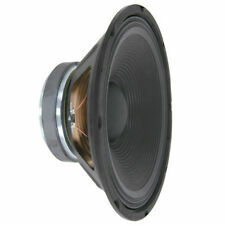 Brand New QTX High Quality Replacement Driver 12" 500w Bass Speaker Driver Cone. KRK LF Driver 5" for Rokit RP5 G1 G2. Compatible Models KRK RP5 G1 or G2. Professional Installation Required Yes. NEW SoundLAB 15" 400W Watt Replacement Bass Speaker Driver Cone Black L041F. NEW AVSL DJ Disco Compression HF Tweeter Treble 902.515. KRK LF Driver 6" for Rokit RP6 G1 G2. Compatible Models KRK RP6 G1 or G2. Professional Installation Required Yes. 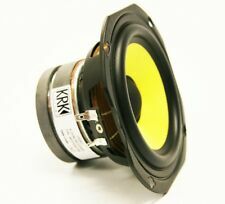 KRK LF Woofer Driver Speaker 6" for Rokit RP6 G2 - WOFK60108 and TWK00012 Tweeter and Surround. KRK Tweeter TWTK00012 and surround. Includes spare mounting screws. Compatible withKRK RP5 G1 or G2. This is to help prevent credit card fraud. KRK LF Driver 5" for Rokit RP5 G3. Compatible Models KRK RP5 G3. Professional Installation Required Yes. 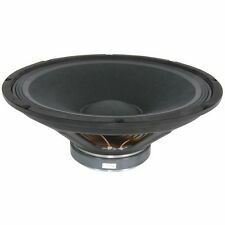 QTX 4 Ohms 10" 100W RMS Replacement QR Series Speaker Driver Bass Cone. Part Number: 14900003. For Peavey Pro 12 or PVXp Pro12 or PVX 12 4-Ohm Speaker. Bass Driver. Net weight lb. / kg: 9.7 lbs. Power RMS (W): 150. Professional PA speaker ideal for a multitude of uses. Made from high grade components. Rigid chassis design for maximum energy transfer. Magnet Weight (oz): 40. Versatile 15" bass and mid-range driver providing 96dB sensitivity and 150Wrms (AES standard) power handling. Pefect spare parts for Wharfdale Titan 15 speakers. D-704A Bass Driver. KRK LF Driver 6" for Rokit RP6 G3. Compatible Models KRK Rokit 6 3rd Generation - RP6 G3. Professional Installation Required Yes. •Used in Pro 15, Pro Sub, PVX15, PVXP15, PV115 & PV215 4 Ohm Peavey Speakers. PEAVEY 15" 4 ohm driver. •Peavey Part Number: 14900004. 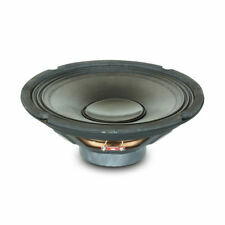 Used in the following 15" 4 ohm Peavey Speakers • Frequency Range: 40 Hz - 3 Hz. HD25 70 ohm speaker will fit either L or R (only 1 supplied) (not SP or Light) - 570609. HD25 70 ohm speaker unit, either left or right. 9am-6pm, Mon-Sat. DVDs, films & TV. Power RMS (W): 150. Professional PA speaker ideal for a multitude of uses. Made from high grade components. Coil Size (mm): 50. Magnet Weight (oz): 42 (1.2 kg). This is to help prevent credit card fraud. As fitted to Citronic CV15 and CV15A speakers. HF HORN DRIVER. • Coil size: 44mm. • Freqnecy response: 800Hz - 20kHz. Peavey PRO15 8 Ohm 15" Bass Driver. Voice coil: 62mm (2.5"). Version: 38cm (15"). Weight: 5.27kg. Magnet size: 156 x 20mm. 700W Peak 350W RMS Power. Power : rms: 350W. For Subwoofer Speakers. An 18" chassis speaker made from steel with a ceramic magnet. Frequency response: 37Hz - 3kHz. Voice coil: 3". FUlly working. This item can be ocllectd or dleivered. Now for the boring stuff Rest of the Word: We have an account with DHL so our prices are competitive. •For PRO 12, PVXP 12 & PVX 12 Enclosures (8-ohm versions). This driver fits the following Peavey products: PVX 12, PVXp 12, PRO 12 (8-ohm versions). PEAVEY 12" 8-OHM DRIVER. •Peavey Part Number: 14900030. For Peavey PRO15 or PRO SUB 4 ohm 14900004. Speaker Basket. Sale is for a pair of piezo horn tweeters. The thread is 32mm approx so could fit many flares. Frequency Response (Hz): 30-20000. For the Kam RZ12A V3 Portable Speaker. RZ12A V3 Portable. 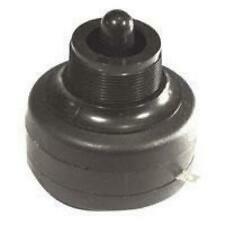 Will fit the following Kam Speaker Bass Driver Speaker Basket. Peavey 1208-4 SPS BW Complete. Black Widow 12" Speaker Driver. 4 Ohm. Impulse. Can also be used in the Impulse 200 Sub, and would be suitable for use in many other Peavey speakers reinquiring a 12" driver. You cannot just change your mind. (also see fraud notes below). T his may also includ e internal components should I deem it necessary. 2 x Peavey 1208-4 SPS BW Complete. Black Widow 12" Speaker Driver. 4 Ohm. Both in full working order, removed from a pair of Impulse 200. Can also be used in the Impulse 200 Sub, and would be suitable for use in many other Peavey speakers reinquiring 12" drivers. You cannot just change your mind. Sale for a Peavey 15" speaker driver Mod1505-8. Good Luck! Sale for a Peavey 15" Black widow speaker driver Mod1505-4. Good Luck! 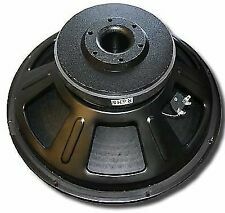 Sale for a Peavey Block widow15" speaker driver Model1505-DT. Good Luck! Part Number: 14900030. For Peavey Pro 12 or PVXp 12 or PVX 12 8-Ohm Speaker. Speaker Basket. Bass Driver. 10" woofer for Yamaha DXR10 2-way active loudspeaker. NB: The photo of the loudspeaker is for illustration purposes. •Used in Pro 15, PVX15, PVXP15, PV115 & PV215 8 Ohm Peavey Speakers. PEAVEY 15" 8 ohm driver. •Peavey Part Number: 14900004. Used in the following 15" 8 ohm Peavey Speakers • Frequency Range: 40 Hz - 3 Hz. Due to the high efficiency of the piezo system, the amplifier is hardly loaded. Highly efficient Piezo system. Useful for SR1 MK2 / 8 ohm and SR3 - MK2 / 16-ohm loudspeaker. -suitable for SR1 - MK2 / 8 ohm and SR3 - Mk2 / 16-ohm speaker. Marke Celestion. If you have a defective SR1 in 4 ohm version Who has a broken SR1 in 4-ohm version. A high quality SoundLAB PA speaker. This product is ideal for building into bass enclosures to extend the frequency range. Sensitivity (dBV/Pa): 98. Resonant Frequency (Hz): 33. Power RMS (W): 300. Peak Music Power (W): 400. 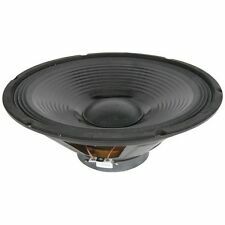 Peavey 15" Black Widow Speaker Driver - 1505-DT 4-Ohm. (speech for example). T his may also includ e internal components should I deem it necessary.